It must have been the bloody rodent and pigeon carcasses seen dropping from the 12th floor that finally drove the co-op board of 927 Fifth Avenue in Manhattan to evict perhaps its most famous resident. But even though the crisis is now passed, we’re still reeling from the public relations disaster—one the board should have anticipated given the tenant they were throwing out. Sure, the likes of Mary Tyler Moore and CNN host Paula Zahn live at the posh address. 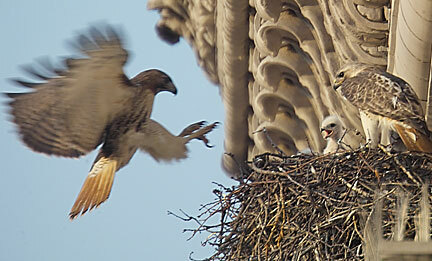 But the red-tailed hawk Pale Male (and his consort, Lola) eclipsed them all. When he first moved on to the building’s cornice in 1993, he was the only known hawk in New York City. Since then, he has sired 22 children, some of whom can still be seen circling in Central Park. At the very least, the board should have first floated the idea that it was considering such drastic action. Instead, with no warning, a construction crew appeared and workers could be seen removing the sticks that held together Pale Male’s nest. Worse, they even took away the building’s spikes—intended to keep pigeons at bay—that helped the hawk securely attach his home. Naturally, such ill-conceived and executed plans sparked huge anger. The building’s lawyer got over 200 e-mails from around the world, some of which included death threats. Of course, the local chapter of the Audubon Society also jumped in to the fray. At this point, the board decided a full retreat was in order. It would even pay for the construction and installation of a box where Pale Male can rebuild his nest in exactly the same spot. That’s a start. But the board will not live down this PR fiasco anytime soon. We bet relations inside 927 will remain frosty for some time to come.